For this recipe I am using a pressure cooker to save literally hours on the stove. I place all of my ingredients except for the Half and Half and the frozen peas into the pot of my pressure cooker, and stir well. 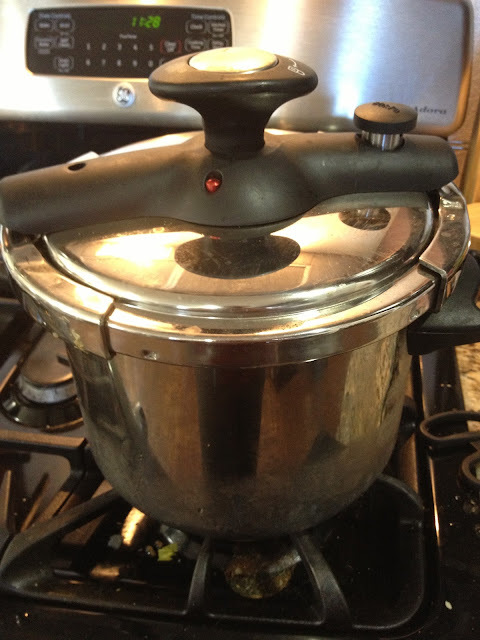 Depending on the pressure level of your pressure cooker (mine is 80kaP) I set my pressure cooker on high until it begins to release steam, then turn to medium high to avoid burning my soup and let it go for about 20 minutes. Release pressure, either by the cold water method or by letting it stand on the stove (check your models instructions) and open up your pressure cooker. I will mention, I have burned myself pretty bad in the past by not using a pressure cooker correctly, I does pay off to read the instructions and feel comfortable using it before making pea soup. Boiling potatoes or something that is in water the first few times is good to become comfortable. 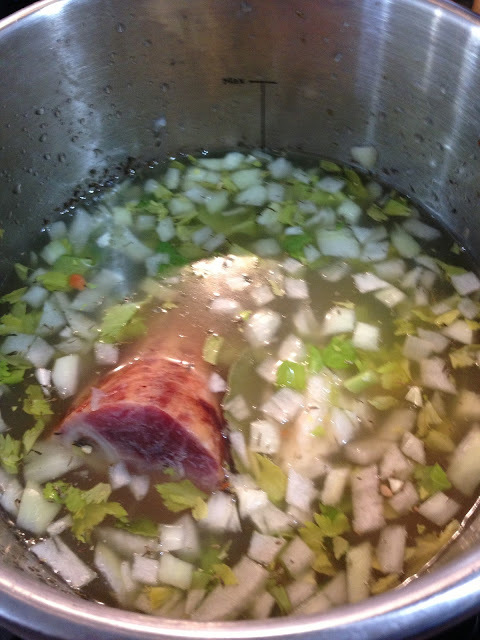 Cooking molted hot, thick pea soup is asking for serious burns if something goes wrong (I know from experience). Once you've opened your pressure cooker, give it a stir, and see where your at. 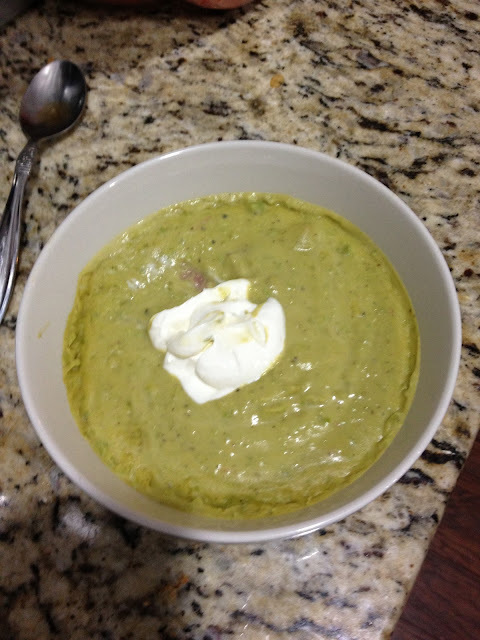 It should be thick and creamy with no discernible pea pods. Then I like to take the pressure cooker pot and add the frozen peas in. I cook it, open, on the stove for 5 minutes until the frozen peas have cooked. Then I add in my half & half and use an immersion blender to blend my soup to a smooth consistency. You can adjust the thickness by added more half and half, it will continue to thicken as it cools. 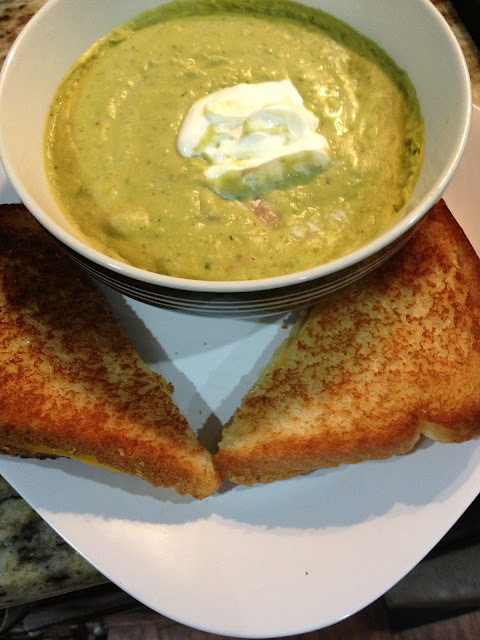 I like to serve my soup along with a grilled cheese sandwich, and a dollop of sour cream on top. It is wonderful.